Color: Liquid Glass. Thinking Putty comes in 30 colors, including glow-in-the-dark, heat-sensitive, and electric-colored putty. It can stretch like rubber and bounce like a ball, and because it’s silicone-based, it won’t dry out or crumble over time. It’s part toy, part stress reliever, part physical therapy and entirely addictive. Once you start playing, it’s hard to stop! 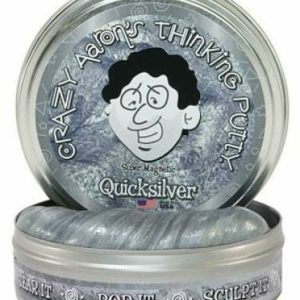 Glow in the Dark Thinking Putty is hypnotic and irresistible. Milky white in daylight, their glow magically appears when the lights dim. It’s translucent — so the glow appears to come from deep within! Made in the USA. Krypton DEFINES eerie, outer-space, alien, radioactive green! Charge with sunlight. Wakeup before sunrise to see it glowing hours later!. Perfect for anywhere you like to play.